Delirium is a haunting first-person psychological horror game, made from the ground up exclusively for VR. A small indie game built around bigger themes of loss, lust and self-inflicted misery. It's a tale of Jon and Anna who moved into a long abandoned home and vanish within 30 days, without leaving a trace. Exploration Based: The emphasis is to explore this house and discover its secrets through each room and secret areas. Narrative Driven: The entire game is based on a narrative about this house and its inhabitants. It invites the player to explore the world to unfold the story. First-Person VR Exclusive: A VR exclusive first-preson game where everything from environments to interaction is built with the idea of VR in mind. Atmospheric: Atmosphere driven cinematic game, to convey the foreboding and unsettling feeling that the house imposes effectively. A horror game is less dependent on monsters and more on the dreary atmosphere of its world. The very air should feel thick with the impending dread to convey the essence of psychological horror. Puzzles/Gameplay: There are locked doors and secret places that need a combination lock or a puzzle or a key item to navigate. Audio Diaries: Audio dairies are scattered in the place, providing key first-hand account of tragedies that befell the past inhabitants and what occurred to them over the 30 days. Lastly, I'd like to say that this is a short one-man made game that tries to be ambitious despite its small scope. It's pure indie in its essence and my humble node to all the inspiring horror classic games and cinema that I have grown up with. Creating Delirium has been an incredibly rewarding experience, despite the fact that it was a daunting task for me to take, as this is my first game project without having any experience with making games or having learnt any art or programming skills prior to this. I want to share my experience as a complete beginner to the world of game making in how I made this game by myself from early writing process to the creating 3D models and lighting etc (This whole game development; and my process of learning, started in 2016 and after getting a preliminary version out, I redid almost everything when I decided to make it a proper VR game). Roman Polanski's quasi horror trilogy Repulsion, The Tenant and Rosemary's baby. The Witch by Robert Eggers P.T. (the teaser for the now cancelled Silent Hills game) by Hideo Kojima & Guillermo Del Toro. All of these have been exceptional at creating a true atmosphere which feels terrifying without being overwrought and cheesy. They have been able to create a sense of dread through a compelling narrative and detail the journey of a character that is going mad while the world around them is either indifferent or actively taking part in destroying them. These inspiring works were a source of inspiration and a sense of direction. As I was conceptualizing the game in my mind I was also thinking of the main source of interaction and a main entity that will serve as an enemy/ghost/antagonist. I didn’t want a ghost jump-scaring us every too often,I wanted the madness itself to be the fearful entity and the monster to be only one manifestation of that madness and not the center of the story. So I devised a sense of place in my mind where certain areas would be the “encounter zones” and other areas that explored the atmosphere and story more. This is my first game project so I knew I had to tackle the project in a way that I could reasonably finish the whole thing from beginning to end and also able to learn a lot about all facets of game development. I knew I couldn’t have animated characters that the player can engage with so I didn’t have animated NPCs that would tell us the story. 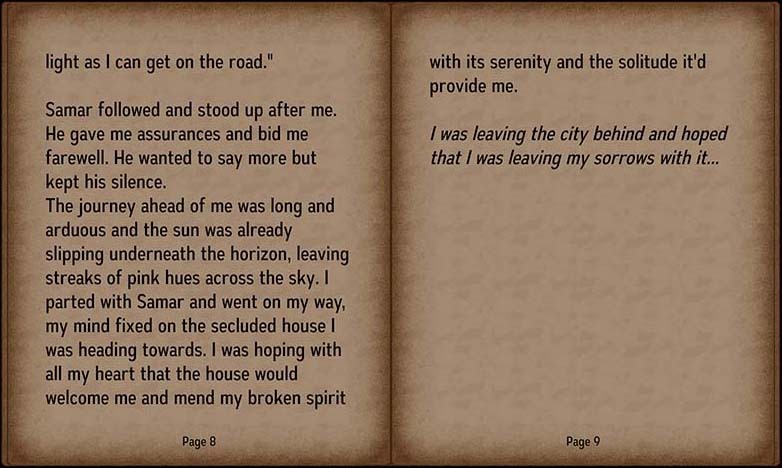 Initially I used journals that would be detailing the narrative and what happened to the characters in the story. 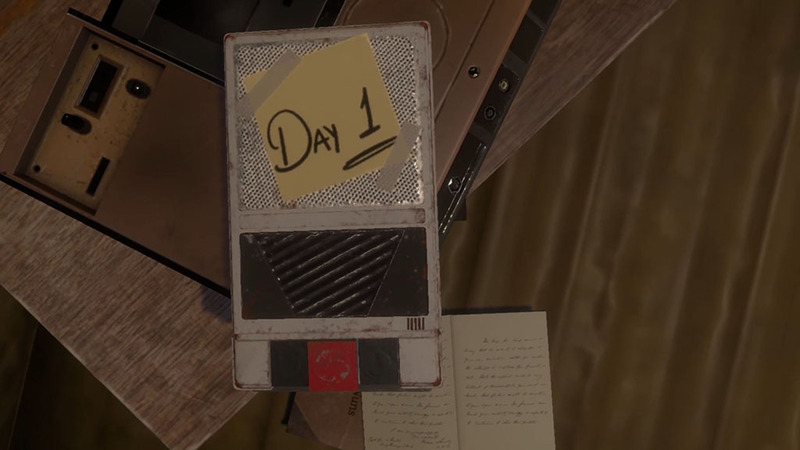 But as the game transformed into a full VR game, reading diaries became out of the question as reading long passages in VR is an excruciating experience for our eyes. So I moved to audio diaries that will recall certain events, recorded by the inhabitant of the house. Giving voice to the character made it more impactful and allowed the player not bound to reading passages in one place and they can be liberated to explore while listen to the tapes. But this also meant I had to rethink the way the story will be told as the tapes had to be concise and without lengthy expositions. First thing to always think about, when I’m writing a story is the central idea. The conflict or dilemma around which the whole story revolves around and which also dictates the kind of mood you will set for the game. So, when I started writing Delirium, I spent a lot of time thinking about the main conflict that the hero faces in the story. He has gotten himself in a situation where he has to make a choice and either way, the consequences are devastating. Once the main conflict and central theme was set, then it was all about filling the gaps in the story and giving the audience, the pieces of information about his past, one audio tape at a time. The rest of the story will have to be told through environmental storytelling, which I relied heavily on. Game making is a visual medium and that means a lot of the story has to be told through the environment. The house itself was a character and for horror stories particularly the setting itself is almost as important as the protagonist. So the visual design and all the details within it would directly feed the story Another aspect to consider while writing is finding a balance in story progression so that we see it unfold and escalate in tension chronologically without sacrificing the player freedom and their ability to move freely in the space. Once you figure that out, then it’s just about tweaking, refining the narrative and polishing key events in the game while retaining the focus on the core theme of the story. I tried to apply this principle to every step of game creation from story to asset creation, lighting and sound, which resulted in a more cohesive and unified vision for the game. 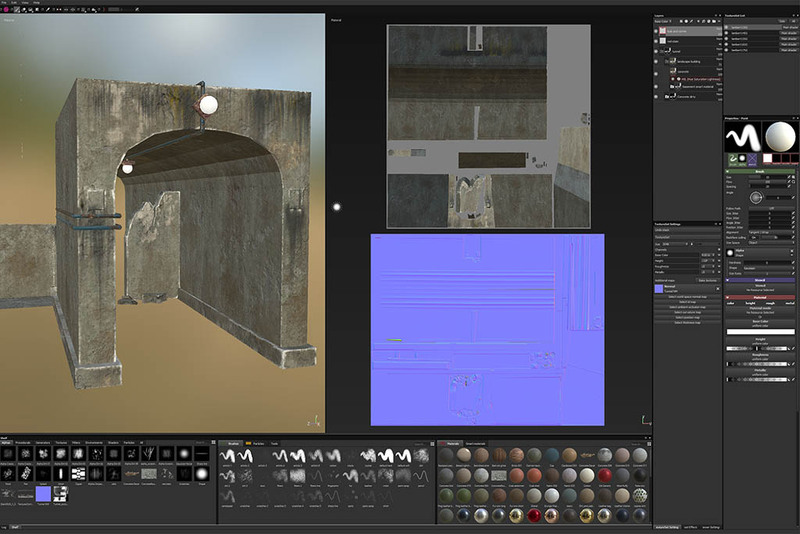 Modelling and Texturing: Because this whole game project was a learning process for me, I am a beginner in all things related to game development so I had to learn new softwares and packages to meet my needs as I was building the game. Modelling and texturing are very complex processes, as with everything in game development, but I found out quickly that I could develop these skills to almost infinity and still be scratching the surface. I made my first model in Maya by just diving in and basically just pushing and pulling vertices until it looked right. There was no sense of topology, efficient use of polygons or any consideration for game asset creation. I learnt these things on the go. That technical knowledge was very useful but I would say that it’s more important to understand on an abstract level what makes something look good and how to create forms and shapes which are unique and attractive, because the techniques and terminology are relatively easy to learn but it takes a lifetime to understand how to create objects or places which are striking and eye catching. Observing real world objects has been my best teacher in this regard. So, because I was learning on the go and taking bits and pieces from everywhere to suit my needs (very much like Guerrilla filmmaking), my workflow was evolving throughout the game creation. I started with Modelling in Maya, Zbrush and texturing in Mudbox. But I saw how next gen games had amazing looking textures and materials and in order to replicate that realistic look, I started using Substance Painter. For normal mapping, UVLayout was a very good tool and I would alternate between Maya and UVLayout for UVMapping, sometimes even Zbrush for organics. 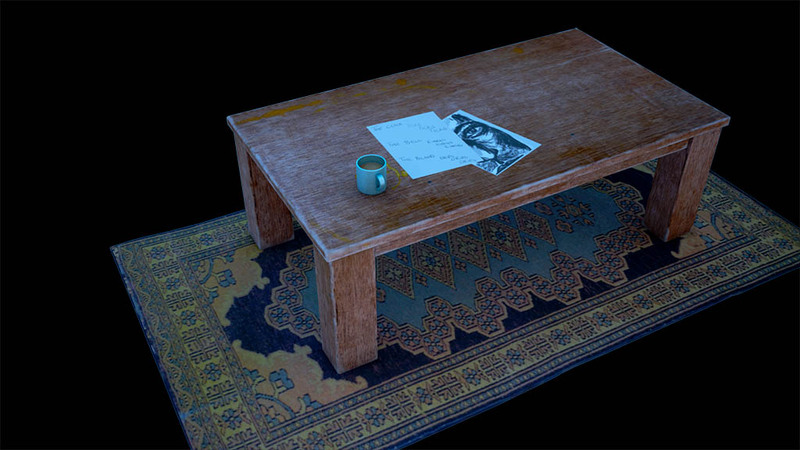 Another part of learning 3D Modelling and texturing was translating those into Unity and how things looks in the engine in realtime. I started to realize how a lot of my work which was spent on detailing the tiniest things on a relatively minor asset but those details were almost lost and my time was wasted on creating something which was not detectable in the game. So, there was a shift in perspective as I went along to realize where to spend most time in texturing and modelling and where a small amount of work gave good results. Lighting is all about trial and error and just having fun with the values to get precisely what you want. It’s quite subjective as to what looks great but adhering to naturalistic approach always improves your work. However, it’s all dependent on the kind of mood that you are creating. In my case, it was imperative to have very dark shadows to create the feeling of unease as if the darkness is swallowing the light. For this reason, I had very little indirect light in most areas of the game, leveraging the direct light from point lights and using Ambient Occlusion heavily to have much darker corners. In reality, the light doesn’t behave in this manner but it was an artistic choice to serve the mood of my game and heighten the tension. It served the purpose of putting you in the shoes of the protagonist who fears that the house itself is alive and sinister, slowly creeping its shadowy fingers across the walls. As I mentioned, most of the lighting in the game is through point lights, with an exception of couple of instances where I used spot lights to represent light coming from a desk lamp. I didn’t use any ambient light from Skybox or any directional light coming from sun, keeping the light source to be only from the man-made lights i.e, light bulbs.Most of the lighting was baked, not only because realtime lights are expensive but also because baked lighting gave a cleaner more aesthetically pleasing look and there was no need to use realtime lights unless the light would be flickering. Although at one point I did play around with using realtime and baked light in conjunction to give some interesting results. At the end, I was quite glad that the whole baking process was not excruciatingly long(although it did seem to go on forever when I turned Final gather on, so I decided not to use it). The performance boost was essential for VR gameplay so baking lights made even more sense. Animation was kept to a minimum as this being my first game project. But I used them sparingly to contrast the silence and static nature of the world. I placed some dust particles and some flies around places to give the static world a little life.I modelled an owl and placed it on a branch of the tree. Owls are usually very still in their posture apart from their eyes and neck, which means I could get away with a simple x-axis movement of the neck back and forth and still feel like it’s an actual alive bird. There were also some lights that reacted to the player’s presence to alter the look of the environment. But most of the lights were static and I used different types of light fixtures to emanate different look and intensity of lights.The player opens doors, some of which are locked by a passcode. The animation for passcode was easy as the sensors track the position of hands in VR which means the player can tape the passcode with their fingers. I tried to use simple fewer animations that will strive to give the player a little thrill and when you coincide those animations with progression of the game then it becomes more satisfying. Setting up audio in Unity is very straightforward and intuitive so it’s was just a matter of tweaking the volume and the distance of the source audio to the player to convey how far or near a sound is coming from. The 3D spatial audio is fantastic and adds greater immersion so I used that in my project for important audio clips.The audio primarily consisted of audio tapes which I recorded with a voice actor. Because I didn’t have dozens of NPCs to vocalize, I did spent some time to get the main audio tapes right, with a feel of emotion that doesn’t sound robotic and can inspire fear/empathy/understanding with fewer words. I edited these fx sounds in Audacity before bringing them into Unity.Sound design and audio is all about playing with the balance of silence and sound. To know when to use either is the whole key and finding that balance is a long process of practice and consideration. Ending Note: I have only scratched the surface in terms of what things to consider while making video games. But my goal was to get acquainted with the engine and some of the tools while having made a small game from start to finish. So at the end I’d have built up some experience and learnt few skills of game development while keeping the focus and scope in a singular direction in order to finish the game. The whole prospect of learning Unity tools was overwhelmingly daunting but keeping the focus small and towards building a project kept me from burning myself out in exhaustion in the face of consistent learning and potentially giving up. In these last few years of diving in, I atleast learnt the scope of things that are possible with the tools Unity provides which is enough to keep me excited to learn and make games at the same time. On top of it, Unity’s constant updates over the years have improved and made the tools a lot easier and intuitive to control while getting great visual results. This is an additional motivation factor for me despite the fact that I have powerful tools that will each take years to master on a long road of trial and error. But that’s something I’m happy to contend with as long as I can keep seeing fruits of my frustrations. If a complete novice like me can dive into this massive warehouse-of-machinations and get some kinds of results then all I need is just determination not to give in, in the face of failures, this simple strategy of perseverance is my only strength, all other skills are just the direct result of that singular strategy. I hope to keep making games using the knowledge I have gained so far, apply all the lessons to the next game and repeat ad infinitum.